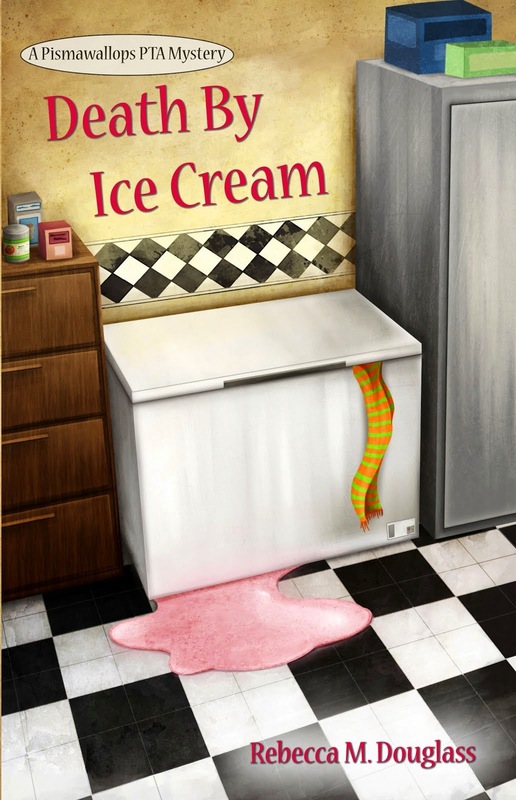 In celebration of the final two days of the special sale price for Death By Ice Cream, I am offering a short story featuring JJ MacGregor and her friend Kitty, neatly solving another problem for Pismawallops Island high school. 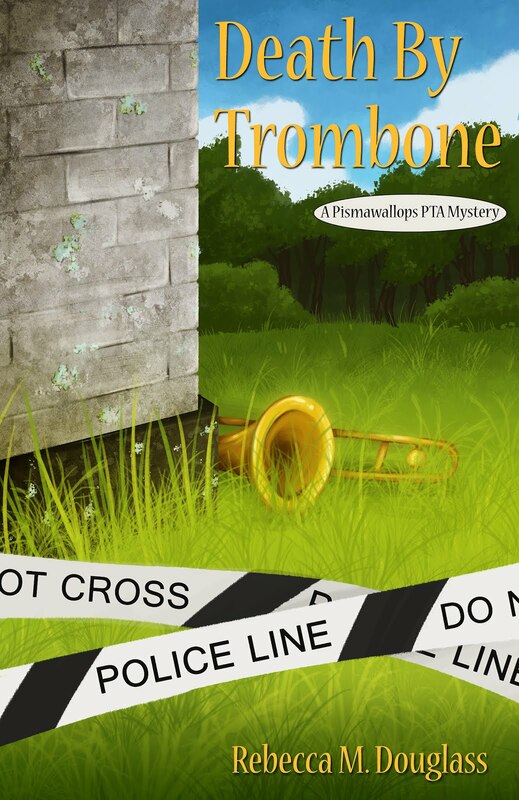 This would take place between the events of Death By Ice Cream and those of Death By Trombone. 998 words. “Anything interesting at school?” I juggled a gallon of milk and an overloaded hand-basket as I made the polite inquiry of my son’s principal. I expected Mr. Ammon to smile and give an equally polite and meaningless answer and get on with his shopping. I mumbled something about, “let me know what we can do to help,” and tried to rest the corner of my basket on a shelf to take some weight off. Why had I said that? I just wanted to get home with my groceries so we could have dinner. Kitty Padgett is my best friend, and PTA president. I’m the VP, and in a school as tiny as Pismawallops Island’s high school, it’s hard to hide when the principal wants something. I set my burdens down and waited to hear what was needed now. Chaperones for a field trip? Decorations for a party? Maybe he hoped we’d throw a nice lunch for the teachers. We could do that. I could understand that. 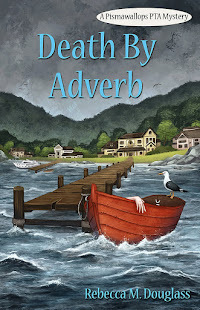 The whole island was still reeling from a nasty scandal, not to mention murder, that had involved the principal and vice principal. That was why Russ Ammon was acting as principal instead of teaching math. The thing is, Kitty and I recently acquired something of a reputation for finding things out, on top of our usual reputation for doing whatever needed to be done around the school. I phoned her after dinner. Next morning we quizzed the kids—her two daughters and my son—while we carpooled to school, but none of them knew, or admitted to, anything of what the seniors were planning. That didn’t surprise me. Part of the fun each year is that no one outside the graduating class knows what they’ll do. I thought about a couple of the kids I wouldn’t mind treating to a little lesson in medieval life, and stifled the thought. I suggested bribes; Kitty suggested spying scopes and bugs. Compared to rounding up a murderer, the kids proved laughably easy. We were still sitting in our car floating silly ideas when a group of students came out to the parking lot and clustered around a nearby vehicle. They never even glanced our way. Since our windows were already down, all we had to do was sit quiet and listen. As usual, the students weren’t all that imaginative. They planned to gather at the lighthouse instead of on campus the following Tuesday, and none too early, either. What was the point of skipping school if you still had to get up early? That was when we began to get ideas of our own. It took little to persuade Russ Ammon, who had a wicked sense of humor hidden under his mathematical exterior. He suggested two or three teachers who might go along, and we were off and running. The hardest part was making sure our own kids didn’t know what we were up to. They were good kids, but the temptation to talk would be powerful. We dealt with that by not doing anything concrete until we’d dropped them off Tuesday morning. Then we got busy, starting with groceries. Ms. Day and Brett Holt were already in the picnic shelter at the lighthouse, unpacking boxes. I passed around cups of coffee from a take-out box I’d gotten at the Have-a-Bite bakery, and we had plenty of time to set everything up before most of the senior class arrived in a clump. What they found where they had planned to meet, hang out, and eat a few chips and sodas was…a classroom with piles of textbooks and two teachers handing out exams. “Exit exams today, kids,” Brett told them, struggling to hold a straight face. Kitty and I lurked behind the big stone fireplace and snapped photos of their shocked faces. We’d find a use for those. When the kids had worked themselves up to a desperate protest, we admitted it was a joke and pulled out the food. Their chips and sodas would make a nice counterpoint to the sandwiches, cake, fruit bowls, and other snacks that we provided. A few of the kids continued to pout, but most of them took it in good grace, laughed, and began to eat. None of them even noticed that their sneak day, when they might have thought of partying with more hazardous things than soda, had fallen under adult supervision. They were too busy playing with the Frisbees and soap bubbles. 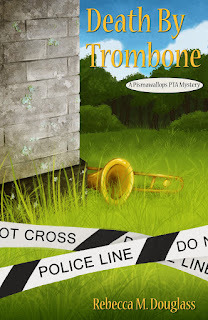 It's been a while since I managed to hook up with the Kid Lit Blog Hop, but here I go. Click on the image above to see the links to other blogs covering books for children! With the backdrop of a large family and a theater as its frame, this is a story about twelve-year-old Leo, who has a talent for transforming the ordinary into the extraordinary. That's why he's called "fog boy." He's always dreaming, always replaying things in his brain. As an actor in the school play, he is poised and ready for the curtain to open. But in the play that is his life, he is eager to discover what part will be his. With the universal theme of finding one's true identity, and set amid a loud, noisy, memorable family, Leo's story is one that all kids will relate to. And there's a full play at the end of the book that kids and teachers can perform! 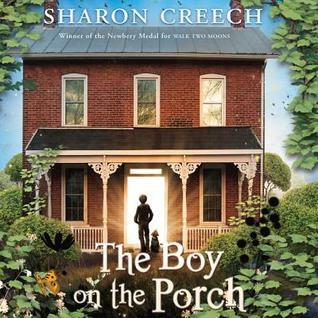 I expect Sharon Creech to provide me with a good read that's also thoughtful and thought-provoking, and Replay did not disappoint. Creech beautifully captures Leo's sense of being the odd one out in his family, the kid who's no good at sports and spends too much time daydreaming. Leo is 12, on that awkward brink between little kid and teen, and he's struggling with a sense of identity. It doesn't help that he's the second of four kids, and his siblings all call him by not-so-flattering nicknames like "Fog Boy," which may be accurate (he does tend to get lost in the fog of his imaginings) but isn't helpful or kind. I liked, though, that in the end we see that Leo's family isn't icky and disfunctional. They are perfectly normal, dealing with a lot of normal stresses, some worse than those faced by others, some less so. It's just that Leo is at that point in his life when it all feels uncomfortable, like he doesn't know how to fit anymore. He likes to imagine himself doing great and grand things, because he doesn't feel like he is seen by his family, but in fact when he does his part in the school play and does it well, they are there and see it and give him the applause he needs. This is a very short and easy-to-read story, especially if one discounts the play that follows (it is the play that Leo's class puts on, and it's subject is definitely relevant to the book, so worth reading), but as usual, Creech manages to capture a whole story and present it well. There were also some very funny lines, though I always wonder when I laugh aloud at a children's book if the kids will laugh in the same place. This might be particularly relevant for middle-school boys (and girls), but it will be accessible and of interest to kids from about 8 up, with nothing a younger child shouldn't read. There is no romance for Leo, just a healthy friendship that we see move to a more mature level, and in the end we see Leo getting the space and the support he needs to grow up. 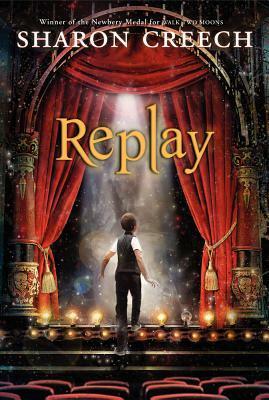 Full Disclosure: I checked Replay out of my library, and received nothing from the writer or publisher in exchange for my honest review. The opinions expressed are my own and those of no one else. I am disclosing this in accordance with the Federal Trade Commission's 16 CFR, Part 255: "Guides Concerning the Use of Endorsements and Testimonials in Advertising." Final week of the 99-cent sale! Here's the second collection of interesting A to Z blogs and posts. Your short-cut to blogging wonderfulness! Pempi's Palace--Tales from the life of a teacher. And this was supposed to have gone up yesterday, and with more than 3 blogs. I'll add in here, in case any of my followers don't already know her, Jemima Pett. And, on a totally more serious note, and nothing to do with A to Z, this is the blog of a group of scientists headed to the Greenland ice sheet next week. They are in their 4th year, I think, of doing research on the melt rates and other issues on the ice sheet. CIRES FirnCover team. I'll do better next week. Really. Publisher: Houghton Mifflen Harcourt, 2003. 245 pages. Hailed by Bill Bryson and the New York Times Book Review as an emerging master of travel writing, Tayler penetrates one of the most forbidding regions on Earth. Journeying along routes little altered since the Middle Ages, he uses his linguistic and observational gifts to illuminate a venerable, enigmatic culture of nomads and mystics. Though no stranger to privation (having journeyed across Siberia and up the Congo for his earlier books), Tayler is unprepared for the physical challenges that await him in a Sahara dessicated by eight years of unprecedented drought. He travels across a landscape of nightmares - charred earth, blinding sky, choking gales, and what is fittingly called the Valley of the Dead. The last Westerner to attempt this trek left his skeleton in the sand, and even Tayler's camels wilt in the searing wastes. But his remarkable perseverance, as well as his fluency in classical and Moroccan Arabic, helps him find here a bracing purity. The Saharawi Bedouin among whom he journeys are ur-Arabs, untouched by the modernity or radicalism that festers elsewhere in the Arab world. By revealing their ingenuity, their wit, their unrivaled hospitality, and more, Tayler upends our notions of what is, and what is not, essentially Arab. For the record, lest you wonder why I chose this book, my younger son is planning to travel to Morocco this summer. I picked up a number of books about the country from the library, and as he elected to read the history of the country, I took this as offering perhaps an interesting perspective on the land. I can only be grateful that my son's trip won't be quite like the author's! Tayler's journey is challenging in many ways, and makes for an interesting tale. There is a certain artificiality about it--the only reason he is putting himself through some serious danger and privation is for the sake of writing a book. I felt that though he clearly has a good grasp of the politics and culture of the land, and is putting himself out to learn more, something was missing from his motivation (apparently a desire to see more of a country where he had been a rather unhappy Peace Corps volunteer). Maybe it's just that Tayler is more honest than many adventure travelers. After all, he is seeking a "first"--a trip through the desert that hasn't been made by any Westerner, and maybe not by anyone, since his path isn't that taken by the nomadic peoples of the Sahara. But that's not what he talks about, unlike many who are documenting their record-setting journies. He is just telling us about a trip, as though he has no choice but to make it. He does want to get to know the land and the people, and that is what makes the book work. The author doesn't pull any punches about the conditions he encounters, nor does he set up any simplistic assessments of the people or the politics of Morocco. He may, as the blurb says, find "a bracing purity," but it is a purity that all too often is living in ignorance and filth, as the nomadic peoples have been forced by drought and changing times into settled life in villages that are in turn dying of the drought. These people are far from the centers of power, but the politics practiced in the capitol do affect them, at times disrupting traditions that might serve them better. The long-running dispute with the inhabitants of Western Sahara is acknowledged, but not explored in any great depth (something which would take a whole book; I know this because I found a whole book on it at the library). What I was left with on finishing the book was both a strong sense of the people of Morocco's desert and an equally strong sense that Tayler and therefore the reader didn't entirely know what he had gone into the desert for. His strong writing just salvages a narrative that probably dwells a bit too long and hard on the filth and flies and his clear lack of pleasure in the land through which he is traveling. There's no denying that if you want to know what the Draa region of Morocco is like, this book will give you a no-holds-barred view of it. It's 13 years old now, so some of the politics are out of date, but the growing concern even then with Islamic extremists rings true--as does the typical person's repudiation of those extremists. I have read more engaging travel narratives, but this one is worth a look if you are at all interested in the area. 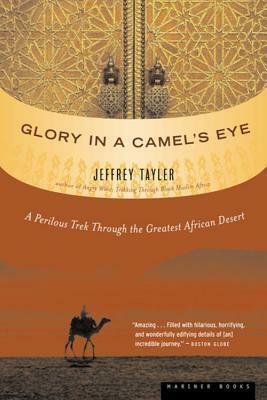 Full Disclosure: I checked Glory in a Camel's Eye out of my library, and received nothing from the writer or publisher in exchange for my honest review. The opinions expressed are my own and those of no one else. I am disclosing this in accordance with the Federal Trade Commission's 16 CFR, Part 255: "Guides Concerning the Use of Endorsements and Testimonials in Advertising." This week Chuck Wendig is back on the job, and he gave us a pretty simple and open-ended challenge: write about a dragon. He then suggested that we think outside the box, maybe do something other than the obvious fantasy story. There's another kind of dragon most of us meet sooner or later. Young Georgie conquers one sort in this story. Chuck gave us 2000 words; I used right around 1000 of them. You are welcome to the rest. 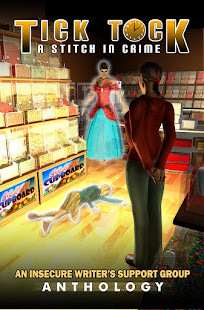 The residents of Oakblossom Lane all knew her, and they were all scared of her. There were two or three cranky old guys who sat on their front porches and hollered, “get off my lawn!’ but they were scared of her too. The children mocked the old guys. They didn’t mock Mrs. DuMont. “First man anywhere ever.” Georgie tossed her head, making all her braids dance and the beads click. She’d sat for hours to have those braids done, and she was going to make full use of them. They clicked for disdain of a boy who didn't understand anything. “Suppose that makes her Adam’s mom?” The children of Oakblossom Lane—a stupid name, especially for a run-down street on the wrong side of the tracks with few blossoms and no oaks—peered again through the ragged hedge that hid them from the woman in her garden. Their Sunday-school lessons had said nothing about Adam’s mom. “Maybe,” Georgie allowed. Wouldn't Adam have died of fear of her? She peered through the branches. Mrs. DuMont was still keeping the birds away from her peas. She was also keeping the children away from the soccer ball that lay only a few feet from her in a lettuce patch. That was a powerful argument. Everyone turned to look at Georgie. Georgie looked at Alec. “Guess we need a knight to ride in there and kill her” giggled Cecile, who read the sort of books that talked about dragons. They looked at him, not knowing just what he was talking about and wondering if he was offering to help them. He wasn’t. He just stood there with his arms crossed, laughing at them. Then they thought about the name he’d offered. Saint George. They all turned to look at Georgie again. “I guess it has to be you,” Jamal said. Everyone nodded. Georgie knew when she was beaten. Six second-graders told her in four languages that it was her job. She took one last look through the hedge and stood up. Little chin thrust forward, and with a few leaves from the hedge still clinging to her hair, Georgie marched out of Jamal’s garden and around to the sidewalk. No one followed her to carry her shield or cheer her as she went into battle against the dragon. “Figures,” she muttered. Leave it all to her, as usual. Whoever Saint George was, he'd probably had to go alone too. Well, whatever Alec said, she didn’t believe the Dragon Lady would eat her. Probably not, anyway. Georgie stood on the walk in front of Mrs. DuMont’s house and waited to stop shaking. She shook worse the longer she stood there, so in the end she ignored her fear and marched up the walk and around to the side of the house. Drat Jamal, anyway. If he didn’t kick the ball so hard, it wouldn’t be in Mrs. DuMont’s lettuce patch. He should have come for it, but he was chicken, as always. Georgie walked around the corner of the house and froze. Close up the dragon lady looked about ten feet tall. She was scowling, and she was looking right at Georgie as though contemplating if she'd be better with BBQ sauce or curry. “What do you want?” As if she didn’t know. Georgie saw her glance at the soccer ball. Why hadn’t she at least removed it from the lettuce? “Please, ma’am, we’d like our soccer ball, please.” Georgie wanted to be as polite as she could be. Maybe dragons didn’t eat polite children. Georgie nodded again, and took a step toward the ball. Georgie looked closer. Several lettuce plants looked a bit squashed, and there were broken leaves. She didn’t know anything about gardens. Could you fix a broken leaf? “Perhaps we should skip the ice cream. I doubt lettuce plants will appreciate it.” Mrs. DuMont’s face was twitching again, and she seemed to be choking on something. “Do you have a band-aid?” Georgie stuck to the point. She also boldly reached and picked up the ball, and bent down to kiss the injured plant. Mrs. DuMont gave up the battle and smiled. Georgie almost dropped the ball back on the lettuce, she was so surprised. The dragon lady could smile? And on the other side of the hedge, six second-graders gasped in wonder. St. Georgie the Dragon Slayer had triumphed. I was debating how to do this--add a few links at the end of my regular posts, or do a special post once a week or something. I'll probably do both. My A to Z Challenge is--not to blog daily, but to visit daily and to share any and all blogs I found interesting. Shell's Tales and Sails--blogging about women aviators--what a fantastic topic, and well done. Inconspicuous Contemplation--a brand-new blogger with the nerve to make the first day of A to Z his (her?) first post. 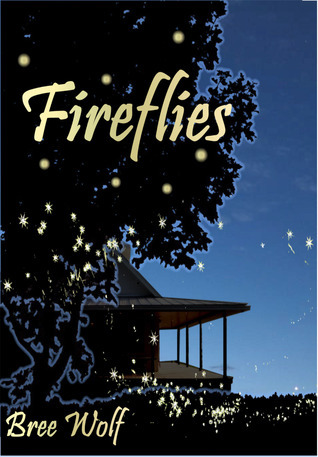 Star Lit Stories--bits of flash fiction around animals (and some less-than-typical animals). Screaming Willow--a brave and open sharing of the writer's battle with eating disorders. I of course failed right at the start, because I spent 3 days camping and hiking with my son, who is on spring break this week. So this post, which was going to go on Tuesday, is coming today, and with fewer blogs than I'd hoped! But here's best wishes to all the A to Z bloggers! First Wednesday, and time for the Insecure Writer's Support Group! Last month I attended a conference on race in our schools, run by the California Association of African American Superintendents and Administrators. While there, I naturally gravitated toward the book sale display by Ashay by the Bay Books. Chatting there with the woman running the booth, it naturally came up that I write. And I had to admit I don't think have persons of color in my books (I don't really describe characters much at all, so there is some wiggle-room there, but the reality is, no, I don't). And she asked me straight out why not. I had to answer with equal honesty: I don't write about people of color because I'm afraid of getting it wrong. Which, she pointed out by implication, makes no more sense than refusing to write about historical periods or a place I haven't been. That is, the answer is research. Checking with people who know the experiences better. Of course, in a historical novel (which the Ninja Librarian is, sort of), it gets even more complex, given historical attitudes, where an author must negotiate tricky ground between realism and modern sensibilities. No wonder I, and many like me, dodge the question. But that's not good enough. The end result of that discussion is that I'm recognizing something that Chuck Wendig has blogged about frequently: it's part of my job to write diversity. And I will have to learn to do it. Not just racial diversity, but also gender differences, and whatever other diversity occurs to me. So: I'm working on it. It's not an easy thing to consider with the Ninja Librarian series, but I'll be doing some re-reading of the first books to see if there's any proof that all the characters are white. I have some ideas about how race might fit in, but it may not work. Book Three, which I'm currently revising, had already found its own way to some gender questions, so there's that. And I promise that Pismawallops Island won't stay as white as the small town where I grew up, once I get back to that project. I'm not much of a writer if I can't write about someone who's not just like me, and I'm not much of a person it I can't move out of my comfort zone. And the science fiction and fantasy I write? Absolutely no reason characters need to be white. Again, I have often failed to describe them, but that doesn't quite measure up. If I'm any kind of writer, I can write people who's experiences are truly unlike mine. How about you? Anyone else hesitate to write people of color or gender variations because of fear of giving offense out of ignorance?